Little Big Shots is an American 60 minute variety family television series, which kicked off on March 8, 2016, on NBC and is broadcast every Sunday at 20:00. The show is currently in its 3th season. NBC is yet to announce the renewal of Little Big Shots for Season 4 as well as its cancelation. Sign up to track down the show's status and its release date. Two of the biggest names in comedy, Ellen DeGeneres and Steve Harvey, have teamed up to showcase some of the smallest talent in Little Big Shots, a new comedy/variety series for NBC featuring the world's most talented and extraordinary kids. The network has ordered eight hour-long episodes of the show, hosted by Harvey, from Warner Horizon Television. 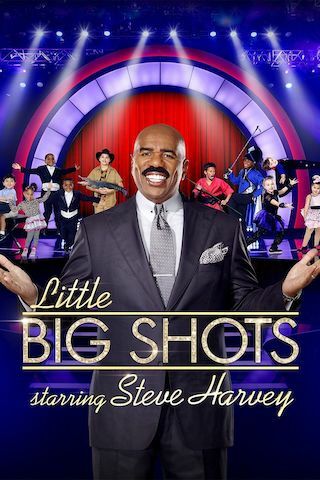 In Little Big Shots, Harvey will showcase young musicians, singers, dancers and every form of wunderkind in the country, and go toe to toe with them in conversations and interviews, with hilarious results. From pint-size breakdancers to 5-year-old piano virtuosos, these gifted performers will awe the nation with their talents, slay us with their cuteness and wow us with their accomplishments. These phenomenal kids show us once and for all that talent is born, not made. On March 14, 2016, NBC renewed the series for a second season, with an order of thirtheen more hour-long episodes.